More precisely, this is an equilateral triangle block quilt, my first ever triangular quilting project, and my first experiment of steering away from my comfort zone of traditional, scrappy and cheerful color palettes to taste something more austere and restrained. A lot of the pieces were cut from Atelier Brunette collections that I bought in Paris last October, so the quilt actually carries quite a bit of sentimental value. However, those fabrics are very thin cotton lawns that I must wash and use the quilt carefully. The advantage of using cotton lawns is that the finished quilt is very soft and delicate, a totally different look than the regular broadcloth quilting cottons. The quilt was made from stripes of 8" tall triangle blocks. The finished quilt top is large (about 70"x84"). I intended to use it as an accentuate piece for my mid-century style couch. I treated the quilt top like a canvas and I "drew" on top of it with millions of stitches! I really enjoyed the free motion time spent on this quilt. I harvested more ideas about quilting my future quilts. Sulky viscose thread was used throughout. I love its shine and sleekness, but I found I couldn't wind full bobbins with this thread on my Bernina Q20. The bottom thread would get caught by the bobbin cover very easily because the thread unwinds by itself!! Like my couch quilt, Quilter's Dream Cotton Select batting was used. I love it's softness but next time I would love to try the Supreme line because I love thick and heavy quilts... although it would be difficult to maneuver on the machine. For all my quilts completed thus far I never had a very specific plan of color arrangement to begin with, and I always wanted the finished quilt top to surprise myself. Sometime it worked but not always. Ben was not a big fan of this quilt. He said the colors are too dark and I had the same feeling. The quilt was finished in June, but I could't find a good location to shoot, to obtain the correct color tones and to capture the delicate details. Finally the 2nd floor hallway of my parent's home won my heart. The grey-ish white wall is a perfect match with my quilt, and it has plenty of natural lights from a skylight and a huge window. For this quilt I prewashed all fabrics prior to cutting. In the end I didn't see a noticeable difference, so maybe I would not do it again... But I did like the softness of washed fabrics, and I simply steam ironed flat the fabrics. No Best Press, no starching. To avoid stretching, I pinned a lot and I pinned both vertically and horizontally. It worked well. Most blocks met on point. To avoid bulkiness some seams were cut and flipped near the seam intersections. No quilt is ugly. All finished quilts are lovely =P A quilt is a functional piece of art. This is literally my first finished quilt of 2018! I started the project last November, and the inspiration was from a set of saucer and teacup china by Miranda Kerr that I received from my friend Jamie for our house warming. My collection of floral fabrics was very limited, so I opted for a crib quilt size piece that I would use as a lap quilt to keep myself warm on a typical Canadian winter day while sitting in front of our fireplace and enjoying a cup of English Earl Grey! The quilt was finished in February, but formal shoots were taken just a few days ago. Yes procastination is my enermy! This is my first hexie quilt! I cut the pieces (2.5" finished side length) using the Multiple Size Hexagon Rule by Marti Michell. This is not my favorite ruler. It is too slippery even after remedied with True Grip non-slip adhesive rings. A lot of the hexies were not cut accurately due to slippage, as well as my inexperience of using the ruler. I started with machine-sewing the pieces together into Grandma's Flower Garden blocks. It was wayyyyy tooooo time-consuming than I imaged! And I gave up after about 10 blocks. I wanted to try a hybrid of machine- and hand-sewing instead, just to avoid the starts and stops of Y seams. I began by sewing the hexies into strips by machine, then I joined the strips together by hand-stitching. It was more relaxing and not as time-consuming as I imaged! I even spent extra time to iron flat the fanned seams and I loved the effect! Also, since 4 of the 6 edges are cut on the bias, stretching and easing the edges a bit and offsetting the seam allowances a bit during hand-piecing actually helped to even out the inaccuracy of the pieces! In other words I forced the pieces to set on point. What a bonus! Batting is Warm and White (the pre-packaged crib size). I found the batting more on the stiffer side, to compensate I quilted the piece with sparsely spaced free-form lines and curls. It took me just one evening to complete and I love the result! The quilt softened up after washing, indeed. The quilting stitches are not too overwhelming or prominent, which is want I wanted. The quilt was finished with a narrow white border, a strip of floral+polka dot print and pink binding, which work together like a framing for the hexies. This little piece turned out to be quite adorable and I got a lot of complements from my friends already. No one can resist from the sweet prints of floral, stripe and polka dot fabrics. This summer we finally got a sofa after years without one. It's the Charles from Huppe that we got during the Bay Days Sale (huge discount!). I made a quilt to put on top of it to serve as a slipcover and blanket at the same time. Since this this a utility quilt that it must be "high-performance" and durable to withstand our daily wear and tear. Also since this is a quilt displaying on the living room it must not be too ugly. In the end I came up with this more modern looking piece measured 84.5"X66". It's a relatively quick made as the blocks are quite large (16"X16") and simple (mostly rectangles, some frying-geese). The most time-consuming part happened to be the borders - cutting and joining 2" strips together is tedious and boring. But I think the time spent is totally worth it as the borders really make the quilt more appealing. My trick of making the quilt "tough" is quilting all-over the less that 2 inches apart. Only simple and basic elements: loops, paisley, swirls and straight lines were used. To save time, I quilted with large scale motifs. My Q20, with it's large harp space, made it so much easier to create big motifs without frequent stops and repositioning. Sadly my Q20 still misbehaved sometimes that it annoyed me with several synchronization error messages while quilting this quilt. I am pretty sure that there is not synchronization issue as the stitches are beautiful and tension is perfect. Still need to make up my mind if I would dismantle the machine again and ask my dealer to replace the computer parts that control synchronization. I also practiced ruler work on this project. I love these extremely straight straight lines, which is impossible when free motion without a ruler. Love it! 40 weight polyester/viscose threads were used for FMQ. I used several types, including Isocord, Hemmingworth, and Sulky (simply for the purpose of using up odds and ends threads). Batting is Quilters Dream Cotton Select. I have been pairing with Quilters Dream Cotton Request (thinner batting) with wool or silk batting for my other projects but this is the first time that I use the Select line (slightly thicker), one layer only. I love the result. It is not as stiff as Warm and Natural, soft, drape beautifully and shrunk beautifully after wash and dry. It does not really have any loft, making it so much easier to quilt, especially when feeding through my sewing machine for stitching-in the-ditch with a walking foot along the sashing. Would definitely use this batting again for future projects! If I make this quilt again I would opt for more neutral colors instead of bright tones. I tend to like a clean and neutral looking living area. Yes this is a good excuse to start another project! I picked up these Gingiber Merrily panels (along with a bunch of fatquarters and yardages) at the Workroom during their sale. Their plain background is perfect for free motion quilting. Spent a few days and I got three gorgeous mini quilts to decorate my house. 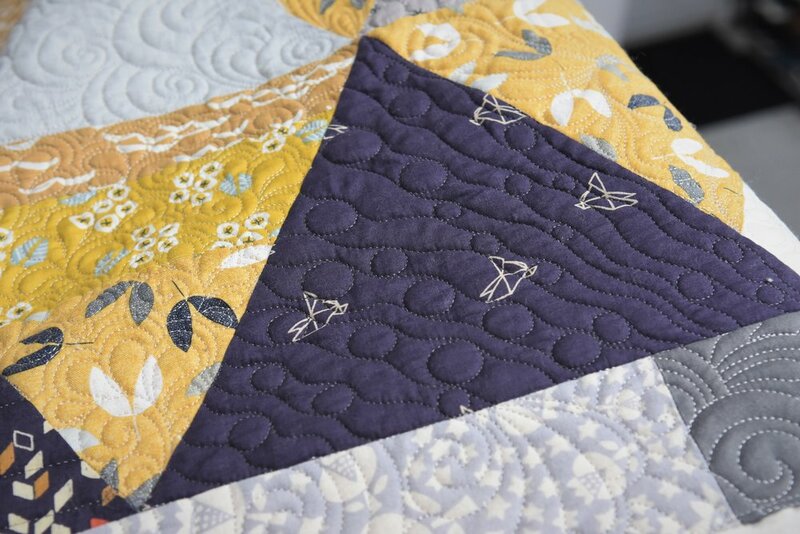 For these quilts I used only one layer of Hobbs Heirloom batting, without a thin layer of cotton batting (typically Quilter's Dream Angel Request) functioned like a backing, like what I have done in my other mini quilts. It's easier to quilt, but I think an extra layer of cotton batting does improve the dimensional texture and enhance the stitching details. I should not make shortcuts next time. I quilted with Superior Thread Bottom Line purchase a few years ago. I found it not as smooth as WonderFil DecoBob. Bottom Line is a matte thread, blending into the fabric quite well but lacking the sheen of DecoBob. I think it can be a good choice for modern, neutral quilts, but the quilting experience is not as enjoyable as matte threads generally have more friction when free motion quilting. I also found when a thread blends so well into the fabric, it can be very difficult to see the stitches while quilting! Just filling in the background with various types of motifs is lots of fun! No markings and no really planning ahead, I simply enjoyed that zen of free motion. It's relaxing and calming. I love these panels and they are already on the wall... Christmas is coming... eventually! These are placemat size (about 13" x 18") samples I made back in July and August. I love the freedom of no-marking free motion quilting. Just relax and doodling on fabric! My favorite thread for dense quilting so far is WonderFil InvisaFil, paired with Size 60 Microtex needles. My favorite batting combo so far is one layer of Hobbs Tuscany Silk + one layer of Quilters Dream Angel Request Cotton (very thin batting). Love the drape and the trapunto finish! Unfortunately, there is something wrong with my camera lens, so you see an off-colored strike through many of the pictures.